In my internet recipe hunting, I came across this recipe for Oreo Cheesecake Brownies from Sweet Pea’s Kitchen. I absolutely LOVE cheesecake brownies, and it had been a looooong time since I last had one. 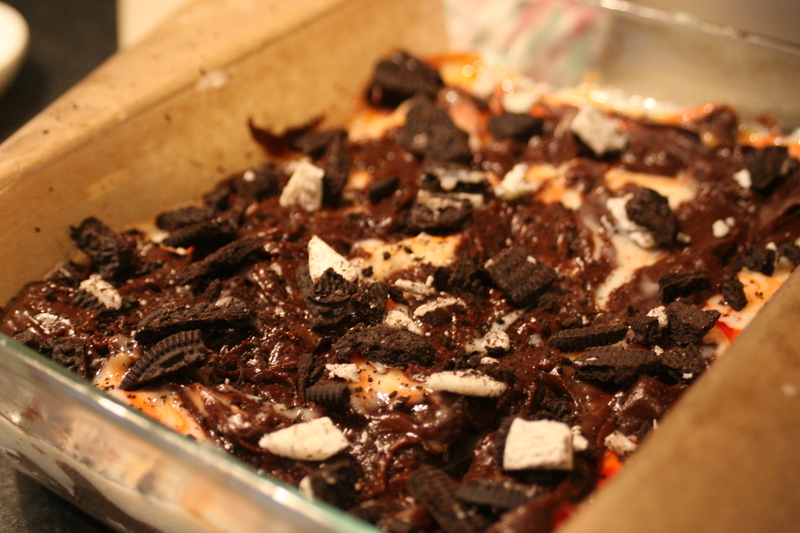 So combine my love for cheesecake, chocolate, AND Oreos?! How could it be any more perfect? I gave these brownies a shot, and they were wonderful. However, this recipe only makes about a half-batch, so you may want to double up if you want to make a full 9×13 Pyrex dish’s worth. In a way this works out well, since I have 2 half-size Pyrex dishes, so I made one normal batch, and one batch with peppermint added to the cheesecake, which was also delicious. Also, I had to increase the baking time quite a bit – most likely due to using the deeper pans. So be sure to keep an eye on them to avoid over or under baking! You’ll know when they’re done when the cheesecake swirls start to brown on top a bit. 1. Preheat oven to 350° F (approx 175°C). Butter the bottom and sides of a 8 inch metal baking pan (I used glass Pyrex dishes for my brownies). Put a long piece of parchment paper in the bottom of the pan, letting the parchment extend up two sides of the pan and overhang slightly on both ends. (This will make it easy to remove the bars from the pan after they have baked. This is a must do!!) Butter the parchment. 2. In a small saucepan over medium heat, melt butter. Whisk in sugar and bring to a boil, whisking frequently; boil 1 minute. Set aside to cool for 5 minutes. 3. In a medium bowl, beat together cream cheese, confectioners’ sugar and vanilla extract until combined, about 1 minute using a hand mixer. This will be the cheesecake for your brownies. If you want to make the peppermint version, use 1 tsp of vanilla, and 1 tsp of peppermint extra. You can also swirl in some red food colouring if you’d like. 4. In a separate medium bowl, sift together flour, cocoa powder and salt; whisk until combined. 5. In a second large bowl, whisk together eggs until combined. Whisk in melted butter-sugar mixture until well combined. Stir in flour mixture until just combined, followed by Oreo cookies. Again, if you’re making the peppermint version and it’s around Christmas – try substituting with the red creme-filled Oreos for that extra holiday touch. 6. Bake for 24-28 minutes, until brownies and cheesecake are set. A knife inserted into the cheesecake mixture should come out clean and the edges will be lightly browned. 7. Let cool completely in pan on a cooling rack before lifting out the parchment paper to remove the brownies. Cut, and serve. My very good friend (Julie M!) 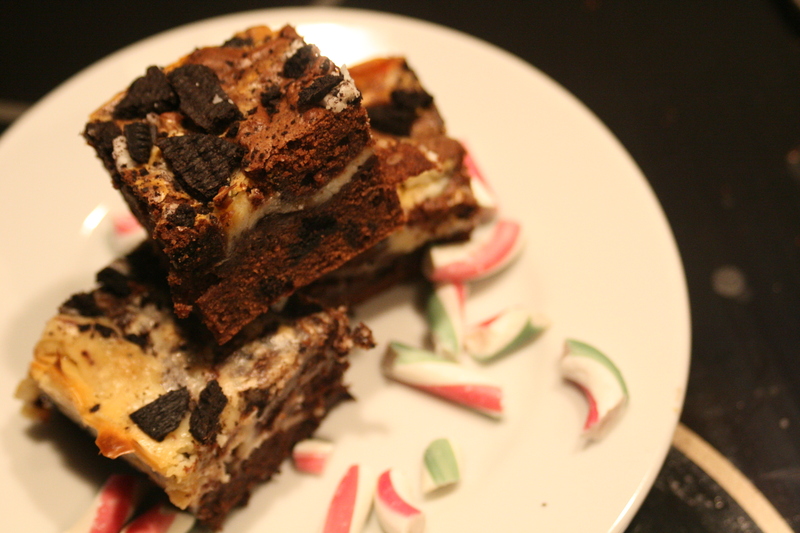 introduced me to your website and I have just made the Oreo cheesecake brownies. I can’t wait to try one, but sadly, they don’t resemble yours. Please could you tell me when I should have added or what I should have done with the cheesecake mixture. I ended up mixing it all together, which I am sure wasn’t right. And I think I over mixed the biscuits! Anyway, the brownies smell divine and I can’t wait to try one. If you get the time, please let me know for when I next bake them. Thank you so much. Hi Caroline, Thanks for stopping by! There isn’t a real science to swirling the cheesecake bit in. I usually just drop a few dollops over the top of the brownies, then just gently swirl it around over the top. Sort of like making raspberry ripple ice cream. Then just sprinkle the cookies over the top and pop it in. The key is to not try and mix the cheesecake in, just swirl a bit! Hope that helps!